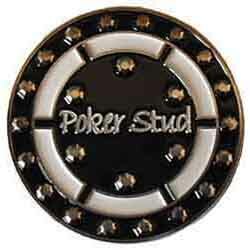 This is the Poker Stud Spinner: 45 mm in diameter, 2.5 mm thick. The spinner is polished nickel on iron and has 24 3-D polished nickel studs. The spinner is black and white enamel on iron. The Poker Stud spinner is packaged in an acrylic box. The weight is 2.5 ounces.